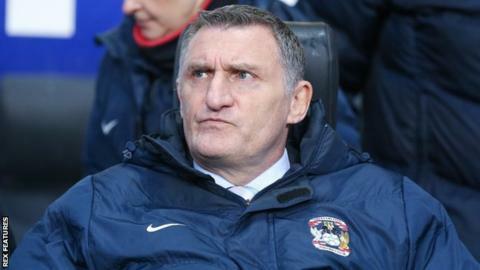 Coventry boss Tony Mowbray says their goal shortage may have ended hopes of reaching the League One play-offs. After losing 1-0 at home to relegation-threatened Colchester on Tuesday night, City are now eight points off the top six with just seven games left. Mowbray is not happy with a goal total of only four in their last eight games. "We want to get out of this division, but it doesn't look like it's going to be this year," 52-year-old Mowbray told BBC Coventry and Warwickshire. "It's because of our inability to score goals at the moment, but we've got a lot of pride and we'll keep going." Coventry made a strong start to the season and were top of the table at the end of November, but results have dropped away and a record of only three wins so far in 2016 has left City with an uphill battle to regain a top-six spot. "It's frustrating and disappointing because it feels like it's petering out," added Mowbray. "The next two games against Gillingham and Wigan will have a spark about them and, if we don't have an edge we'll get found out. We haven't enough goals. One's never enough. If you don't score, obviously you're not going to win." The Sky Blues should have 19-goal top scorer Adam Armstrong available for Saturday's tip to Gillingham after a two-game absence because of England Under-19 duty - but he is without a goal for the Sky Blues in six matches.